We’d love your help. Let us know what’s wrong with this preview of Heave Ho! by José Lucio. 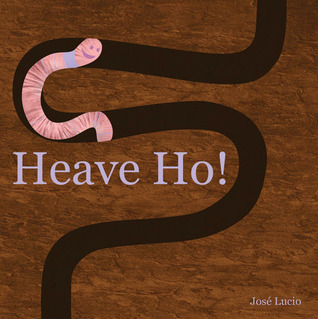 To ask other readers questions about Heave Ho!, please sign up. Be the first to ask a question about Heave Ho! Such a delightful tale. Reminiscent of the Russian folktale, The Turnip, this story is about a happy little worm traveling outside its tunnel to play. Remember the saying, "An early bird gets the worm," which I don't believe anyone bothered to tell the little worm, well let's just say that there is a curious black bird looking for something good to eat. As that black bird nabs our happy little worm... let's just say it will take a bit of ingenuity to end this "tug-of-war." On the black bird's te Such a delightful tale. Reminiscent of the Russian folktale, The Turnip, this story is about a happy little worm traveling outside its tunnel to play. Remember the saying, "An early bird gets the worm," which I don't believe anyone bothered to tell the little worm, well let's just say that there is a curious black bird looking for something good to eat. As that black bird nabs our happy little worm... let's just say it will take a bit of ingenuity to end this "tug-of-war." On the black bird's team is a cat (obviously stalking the bird), and a dog (I'm rather sure had no intention of looking for any worms). On the happy little worm's team are four friends. No matter how much each side "Heave-Ho's" Who do you think will win? Amongst giggles and gasps. With story-time shouts of "Heave-Ho!" Our Library friends put everything they had in to helping the not-so-happy little worm. With the last great bit of heroism... all of our story helpers were rolling on the ground in joy and laughter. With a collage technique, this tale brings an irresistible invite to young audiences. They simply have to hold it, they must "yell" those words of encouragement, and they eagerly claim it as their book of choice to take home and read it again. The early bird catches the worm and in Lucio's story it becomes an all out tug of war! Teamwork and wits are apparent in the fun little Goodreads Giveaway win. With a little push and pull this book will become one that will burrow into your heart. This book for children has a nice theme, even though it is about a bird trying to grab a worm for food, the worm does not become a meal. Young children can be disturbed by creatures being eaten, even though that is the way of the natural world. The plot of the book is a tug-of-war between a group of worms and the odd combination of a bird, cat and dog pulling on the other side. The outcome is whether the worm will be eaten. One of the worms demonstrates some outside the box thinking that leads This book for children has a nice theme, even though it is about a bird trying to grab a worm for food, the worm does not become a meal. Young children can be disturbed by creatures being eaten, even though that is the way of the natural world. The plot of the book is a tug-of-war between a group of worms and the odd combination of a bird, cat and dog pulling on the other side. The outcome is whether the worm will be eaten. One of the worms demonstrates some outside the box thinking that leads to a quick resolution of the stalemate. The dialog is one or two short sentences per pair of pages. The illustrations are colorful and a bit canned in appearance, the bird, cat and dog look like they were extracted from a set of stock images and pasted into the pages. Despite that weakness, this is a book that I would have read to my daughter when she was young. This book was made available for free for review purposes and this review appears on Amazon. I really enjoyed this book. It has a very simple text and story line good for preschoolers. The characters are cute and I really love the way they are made up of real images. I also like the way the story is sandwiched between illustrations of worms heading up and down. The only thing that bothered me slightly was where some of the words overlapped with blades of grass. I would have liked this text a centimeter or two higher, but its a minor thing. Overall i like it! *I received a copy of this bo I really enjoyed this book. It has a very simple text and story line good for preschoolers. The characters are cute and I really love the way they are made up of real images. I also like the way the story is sandwiched between illustrations of worms heading up and down. The only thing that bothered me slightly was where some of the words overlapped with blades of grass. I would have liked this text a centimeter or two higher, but its a minor thing. Overall i like it! This was a really cute children's book. I liked the messages of teamwork and thinking outside the box. The illustration style was cute - a combination of drawing (for lack of a better term) and a sort of collage of photos for the animals. The book is short, but entertaining, and my preschool/kindergarten-age children enjoyed it. I was a winner of a free copy of this book. Sometimes, you worry that they won't be very good but this book was adorable. I have added it to our library shelves and the kids who took it have liked it. We even read it at story time. It is a very simple story but the idea is cute and the illustrations are good as well. I'm glad I entered the contest. I really did win! As Goodreads First Reads Winner- I was very please with this book. The easy text allows new readers to follow along. My son who is an advance reader at 5yrs enjoyed this book. As he read the story, we discussed what might happen next. It was a great start to our summer reading!! A really cute story! What happens when worms play tug of war with animals? You'll have to read to find out! ***Goodreads First Reads Winner**** This is a great children's book with a great message of teamwork! Mama and I have read this book several times. I love the worms!